Jaguar spent a reported £4m on the launch event for its new XE sports saloon model yesterday evening, which saw the car arrive by helicopter over London for a star-studded party attended by celebrities. More than 3,000 guests and celebrities, including the fashion designer Stella McCartney, were invited to a concert at Earls Court arena featuring the Kaiser Chiefs for the big reveal of the new car. There were also performances from Eliza Doolittle, the Royal Ballet and the London Philharmonic Orchestra. The concert culminated with guests watching a giant screen that showed the car’s journey from its manufacturing plant in Solihull to Earls Court. The film showed employees at the plant gathering together to form the letters ‘XE’ while the Red Arrows flew past as the car was airlifted by helicopter to begin its journey to London. 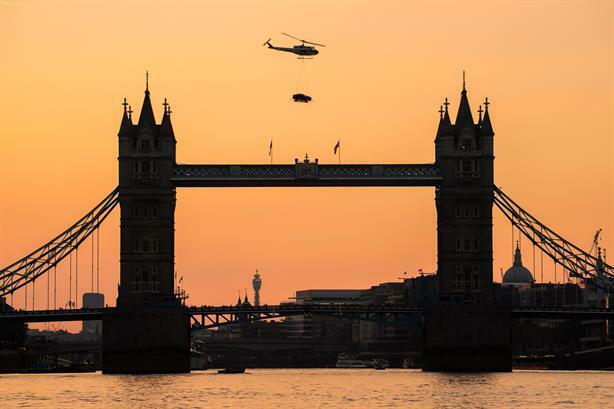 Once in London the helicopter took the new XE along the Thames as far as Tower Bridge before it was loaded on to a speedboat to continue along the river to Chelsea Harbour. During the river journey, the singer Emeli Sandé performed a live new track called ‘Feels Like’ on a floating stage in the middle of the Thames with the London Eye as a backdrop and 300 fans looking on from a nearby boat as red flares were launched. On arrival, the car made the last leg of the journey to Earls Court escorted by two 1960s Mark II Jaguar police cars and was received by a guard of honour comprising six manufacturing robots. The Earls Court venue was chosen because it has been the home of numerous Jaguar launches since 1935.